Take your BW spirit on the road! Here's a great way to show your BW pride and support BW students! 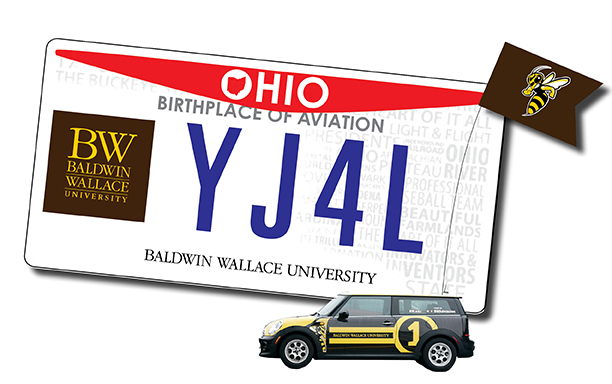 Baldwin Wallace license plates are available through the Ohio Department of Motor vehicles when you renew or first register your Ohio vehicle. Drive proudly displaying your YJ4L (Yellow Jackets for Life) spirit, knowing that $25 of your registration fee will support current BW students. We recommend using screws, not tape. Know that thousands of people on the road will see your BW pride. Plus, $25 from your purchase will go to support BW students in areas such as scholarships, professional development and campus activities. Requests for your plates (whether system assigned, initial reserved, or personalized) may be made at any Deputy Registrar's office, online at www.OPlates.com, by phone at 866-675-2837, or by mail. All plates will be mailed directly to the address on your registration card. Here's the thing: we must sell 150 license plates per year or the BW plate will be terminated from the Special Plates program. As you renew your plates this year, don't forget to sign up for a BW Ohio License Plate!